We enter BUY/SELL positions when MACD crosses the zero point to UP (Green) for BUY orders and when crossing the zero point down (RED) for SELL orders (please note that you MUST wait for daily candle to CLOSE). When we are in a trade we will set the Stop Loss to 100 pips. When the trade goes in our favour by 50 pips we set the exit point at +2 pips so that if the market reverses we will not have any loss. The Moving Average Convergence Divergence (MACD) is a trend following momentum indicator. Using MACD is one of the main Indicators for Forex trading, and it is used by all Forex traders from basic to advanced. It is calculated by subtracting X-days EMA from the Y-days EMA. Then the signal line is plotted on the top of the Indicator to function as a trigger for buy / sell orders. 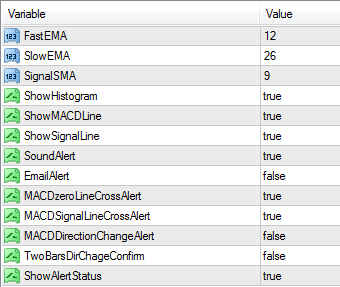 SignalEMA: Signal EMA settings if you dont want to use it set it to 0. ShowHistogram: Do you want to show Histogram? ShowMACDLine: Do you want to show MACD Line? ShowSignalLine: Do you want to show Signal Line?